Jewels of Arabia Game: Open the scroll of 1001 Arabian Nights, and let it take you to the land of mystery and magic. 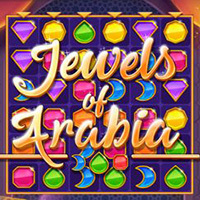 Match unique Arabian jewels, activate power ups and solve match 3 puzzles with strategy. Can you complete the quests? Match gems, activate powerups and solve puzzles in this great new game! Match 3 or more jewels in a row to earn points and remove them from the playfield. Jewels of Arabia is a gem-filled, action packed game with a ton of levels to complete. Updated with new levels and game modes. You can play this game on all devices. So enjoy and have fun in playing Jewels of Arabia. Jewels of Arabia Game is one of our Match 3 Games at Round Games. It also tagged as an addicting and jewel game. To play even more free games, view our most played and all games pages. If you want to play more games like Jewels of Arabia Game: Then you can simply check out the games inside the game tags that are the most relevant to your interests or check the Match 3 Games category or check the related games section at the end of the game page. Also make sure to check out Jewel Academy Game. You may enjoy playing it.